July, as all northern hemisphere birders appreciate, is the month when the egg timer flips and everything starts pouring back out again in a steady stream south. Ponds and estuaries fill up with passage waders and the birding gets good after the summer lull as we rise slowly and surely towards the fever pitch of autumn. In recent years though July signals the start of another return and increasingly it seems to come from several different directions. 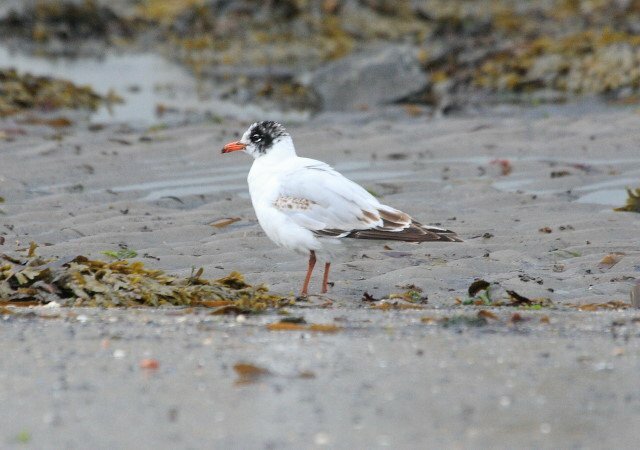 One of Britain’s recent colonisers the Mediterranean Gull begins to arrive in bigger numbers every year as post-breeding dispersal takes hold. 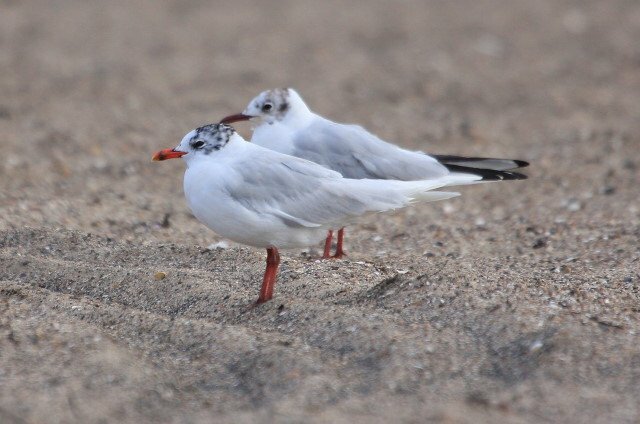 Whilst ‘Med Gulls’ have now been breeding in Britain since 1968 it was only 2009 when they finally managed to successfully breed in Northumberland, England’s most northerly county. However for some unknown reason the small seaside town of Newbiggin-by-the-Sea in Northumberland has developed into something of a magnet for this rather smart European. In fact I would go so far as to say it is probably the best site to see the species for 100 miles in any direction and best of all it’s only 4 miles as the gull flies from where I live. This innocuous looking 1km bay, mainly sand, has a peculiar attraction for Med Gulls drawing in anything up to 28 so far in late summer. As a result of the gradual westward expansion across Europe from it’s origins on the Black Sea coast a number of ringing schemes have been operating allowing birders to trace the origins of many of the individuals that turn up in Britain. Recently local birder Steve Holliday spent some time collating all the local information on ringing reports for this species with some interesting results. 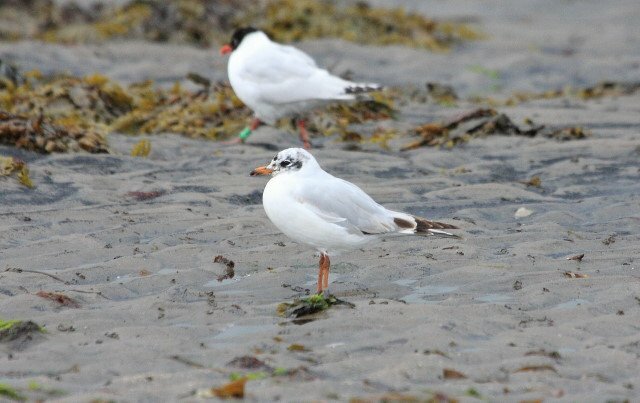 To date individuals have been recorded from nine different countries in Europe; our Med Gulls are coming from Germany, Holland, Poland and other countries as far east as Serbia. Now I know that I will have lost a few of you by now, for some reason best known to yourselves gulls just don’t do it for you. Try harder. These babies are head-turners, doesn’t matter how many times I see them, photograph them, no matter what I’m currently obsessing over if someone whispers ‘Med Gull’ I’ve just got to peek, cos they’re gorgeous. Have some eye candy. 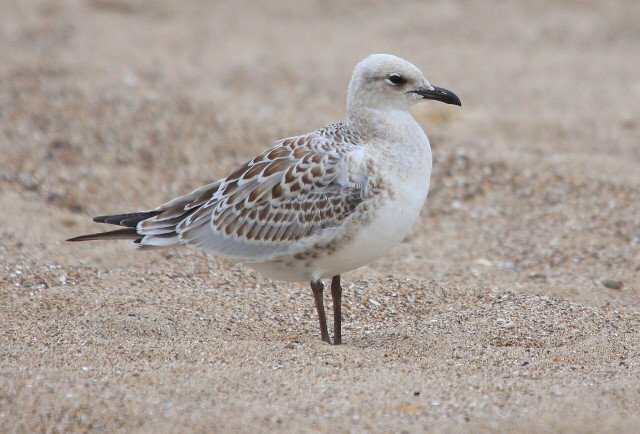 Juvenile Mediterranean Gull in July (above), beautifully marked, note the white edges to the scapulars and the dark legs as well as the larger bill, all good features for separating juvenile Med Gull from Common Gull. By the end of August (above), showing some wear in the coverts and several pale grey freshly moulted scapulars. By September some are almost in 1st-winter plumage with almost all scapulars moulted. Note the smoky dark eye mask highlighting the white eyelids and the base of the bill beginning to acquire a reddish base. Some moult some of the median coverts too as this individual above with only a couple of juvenile median coverts retained in October. Individuals in 1st-summer acquire variable amounts of dark spotting around the eye and hood. Both images above of 2nd calendar year (or 1st-summer moulting into 2nd-winter) show the variation in this as well as the bare part colour changes that have occurred by this time. By the time they arrive back for their 2nd-summer, they’ve pretty much lost any signs of immaturity other than the black marks on the primary tips. The legs and bill have deepened in colour and are closer to adult too. 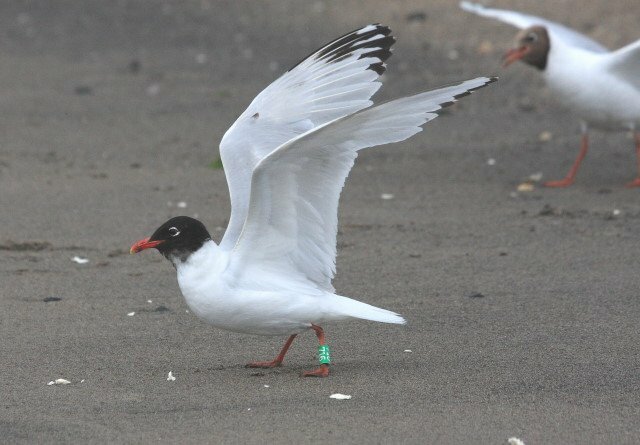 Some acquire an almost adult-like hood, this individual was ringed at Pas de Calais, France in 2009 and first appeared locally in October that year. It subsequently found its way back in July 2010 and ‘went home’ to Calais this spring before reappearing on Saturday when I took the image above after finding it amongst a recent arrival of about a dozen individuals. 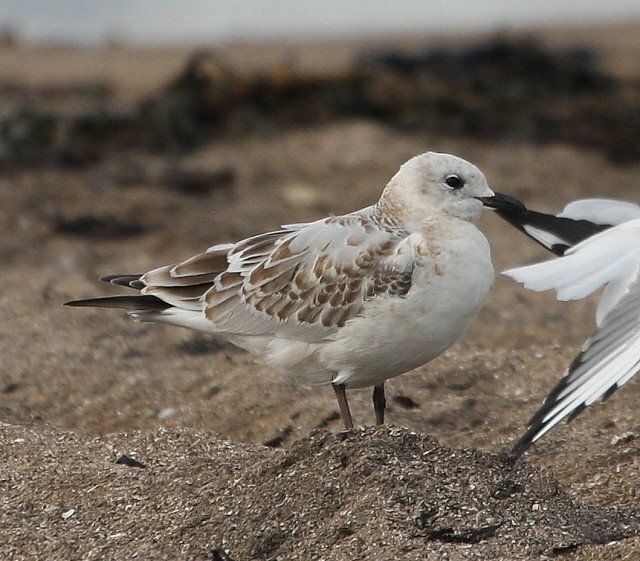 Adults moving into winter plumage show no such dark markings (as above with Black-headed Gull behind for comparison) but note the distinctive dark-banded bill with yellowish tip. 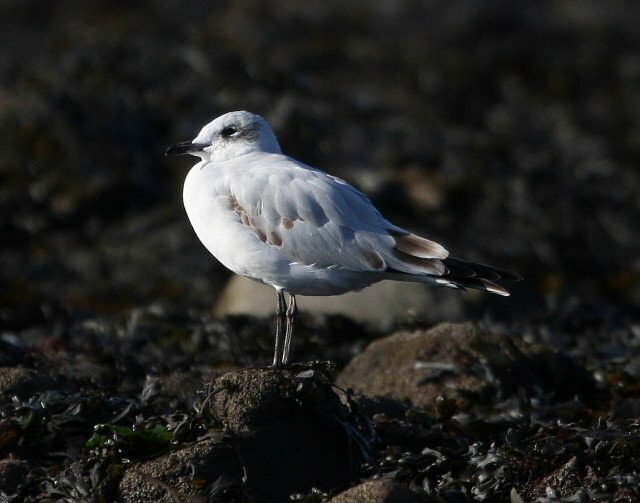 Given the continued westward expansion one of these fantastic small gulls is going to make the trip either over the top or across the Atlantic in the next 2-3 years and turn up on the East Coast of North America. 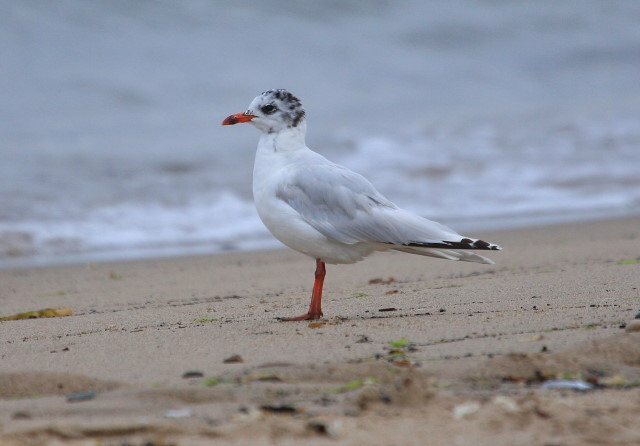 A great opportunity for North American gull watchers to get their name on a first for the region, my guess is it will happen in late July or August, who knows it might already be out there to be found as I write. 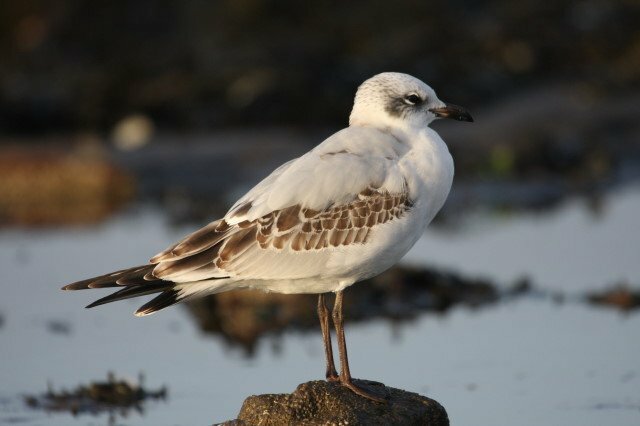 I have always wondered, and wonder still, if the lack of vagrant Relict Gull records in the WP (outside western Kazakhstan) has something to do with their similarity to 2nd calendar year Meds? This thought makes them even hotter!